Biography: Ronald and Grace co-pastor Bugaddu Spring of Life Church, which began in 1997 under a tree in an area where there are no churches. When they started the church they became very involved in intercession and evangelism. Even though they are still the only Pentecostal church in almost a mile, many people have come to Christ. Eventually the church was given land and has now built a building in which to meet. The church has nursery, children's, youth ministries, and a group for married couples, as well as cell groups which meet weekly. The ministry focus is salvation, training by focusing on the knowledge of God's word and will, and good works by bringing relief and development to God's people. The church founded the Rural Empowerment Ministry to promote outreach programs, interpersonal relationship with other churches, and to empower others. 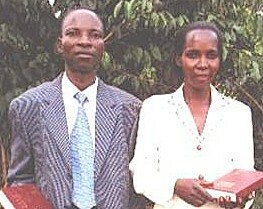 Ronald and Grace planted 2 new churches in villages in 2012. Strengths: Ronald and Grace are gifted in teaching, evangelism, wisdom, and counseling. They are passionate to win lost souls and care for the welfare of orphans.